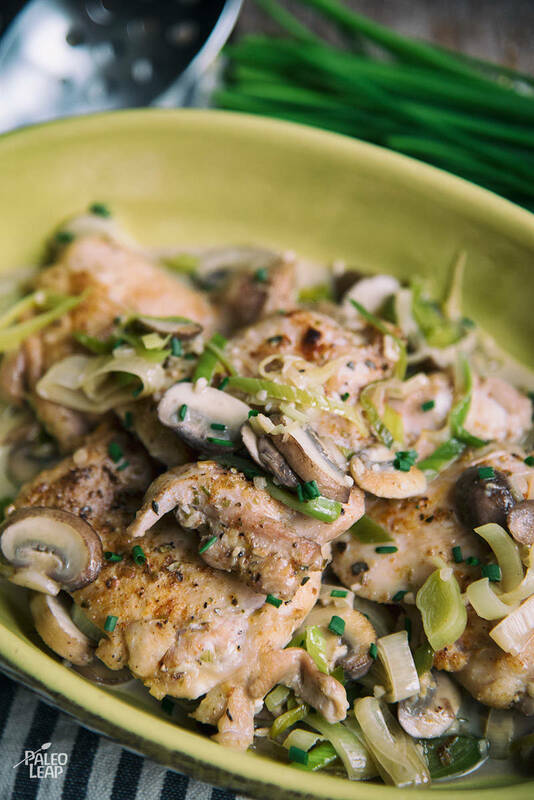 In this simple yet elegant chicken thigh dish, your chicken thighs are cooked to perfection and topped with a creamy, earthy mushroom leek sauce. This dish brings together some of the best ingredients across the Paleo spectrum – the protein-filled chicken, the micronutrient-filled vegetables, and chicken stock, and coconut milk to create your sauce without the need to incorporate dairy. While this dish is perfect for a filling dinner, we also love this as a make-ahead lunch option – since the prep time is a bit on the high side, it’s perfect for a weekend evening when you can dedicate more time in the kitchen, saving your leftovers for the coming week. While we think this recipe is delicious, we know that many diners, including those who ascribe to a Paleo diet, have issues with mushrooms. For many of us, our exposure to mushrooms growing up may have been in an over seasoned gravy or through discovering a bland portobello slice at the bottom of an Italian meal. If you’ve moved away from eating mushrooms, try giving this recipe a try! The dish calls for brown mushrooms, which give it an earthy flavor, but these are combined with other ingredients that tone down the sharpness a tad. For this meal, try rounding out your plate by serving with a simple salad that won’t distract from the flavors of your main course. One we really like for this is this mixed greens, fennel, and pear salad, an unexpected combination that still allows your main course to shine. Season the chicken to taste with seal salt and ground black pepper. Melt cooking fat in a skillet over medium-high heat and brown the chicken on both sides, about 3 to 5 minutes per side. Add more cooking fat to the skillet and cook the leeks and mushrooms 2 to 3 minutes, stirring. Pour in the chicken stock, and deglaze the pan. Pour in the coconut milk and chicken stock and bring to a light simmer. Bring the chicken back to the skillet cook until everything is warm 2 to 3 minutes.